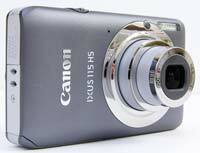 The Canon IXUS 115 HS (also known as the PowerShot ELPH 100 HS) is a new slim and stylish compact digital camera. Key features of the IXUS 115 include a back-illuminated 12.1 megapixel CMOS sensor, 4x 28-112mm lens with an optical image stabiliser, 3.4 frames per second burst mode at full resolution, full 1080p HD movie recording with stereo sound and a HDMI port, and a 3 inch LCD screen. 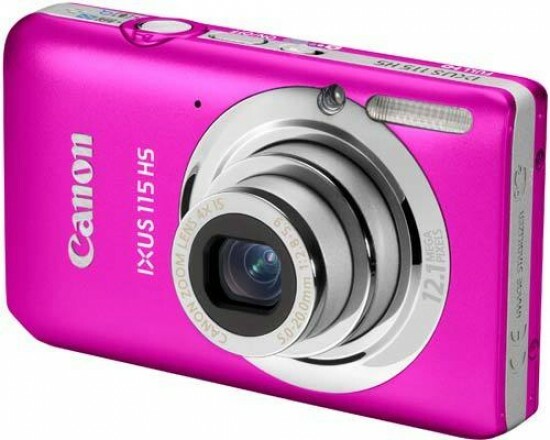 Available in silver, grey, pink and blue, the Canon IXUS 115 HS costs £179.00 / €219.00 / $199.99. Little brother to the likes of the Canon IXUS 220 HS and 310 HS, the 115 HS is a neat looking and affordable pocket compact that surpasses what one would normally expect from a budget model. OK, so it lacks much in the way of manual photographic control as one would expect, but then again there are plenty of creative extras under its glossy exterior to keep the more adventurous men and women of the point and shoot brigade occupied. In that way it much resembles its recent rival in the Nikon Coolpix S3100. With official dimensions of 93.1x55.8x19.9mm the IXUS 115 HS weighs a manageable 140g with both rechargeable lithium ion battery plus optional yet essential media card slotted into place. Once again Canon's pitch here is a 12.1-megapixel effective resolution from a 1/2.3-inch CMOS sensor, with the model's 'HS' suffix indicating this is one of its maker's 'High Sensitivity' compacts. This addendum is part justified by a sensor that is backlit, an ISO range extending up to ISO3200 at full resolution, and low noise Low Light mode (but detail smudging resolution drop to three megapixels). We also get a Handheld Night Scene mode that takes three images in quick succession, and, provided you can find a hard nearby surface to rest an elbow on, produces quite reasonable results. The lens further boasts a maximum aperture of f/2.8, and there is a built in flash should you choose to use it, although it's small and located where fingertips can stray in the way. As we've come to expect with the IXUS range, there's no concession to a handgrip provided here and fingers do tend to skate around a bit on the smooth pebble-like surface. We found ourselves naturally steadying the camera in both hands, but when doing so the thumb comes to rest on the left hand side of the LCD screen smearing it with fingerprints. Despite this we were able to get surprisingly sharp results at maximum telephoto however. The attractively mirrored concentric circles at the front of the IXUS 115 HS - aiding self portraiture, whether intentionally so or not - house an optically image stabilized 4x zoom in their midst, boasting a focal range equivalent to a wide angle 28-112mm in 35mm film terms. Not quite as expansive as the 5x optical zoom range starting out at an equivalent 24mm on the IXUS 200 HS then, for £20-£30 more, but the IXUS 115 HS does offer a larger back screen at 3-inches to its sibling's 2.8-inches, if resolution remains a standard issue 230k dots. Once again the LCD's aspect ratio is 4:3, though if shooting video, here a Full HD 1920x1080 pixels which is a nice surprise, the view narrows to a 16:9 widescreen equivalent, black bands cropping the picture at the top and bottom. Recording video is as simple a process as you would expect thanks to Canon thoughtfully including a camcorder-like red record button at the top right edge of the backplate. Mini HDMI output is provided under a plastic flap at the side, as is a separate port for combined AV and USB 2.0 output. Though cabling is provided in the camera box for the latter, an HDMI lead is an extra investment should you want to hook the IXUS directly up to your flat panel TV in that way for image slideshows. Canon is pitching this camera as a model primarily equipped for 'fun', which is one way of saying its operation is for the most part a no brainer, and once you've set date and time you can be up and taking pictures nigh on instantly, the camera powering up from cold in just over a second via a press of the lozenge shaped on/off button set into and level with the top plate. The rear LCD bursts into life and previously folded lens extends from its storage position within the body chassis, aiding overall compactness. Adjacent to this we have a simple fingernail operated slider switch for flicking between Auto (Smart Auto, which compares the scene/subject with up to 32 presets and theoretically selects the best one) and Program modes, in lieu of an actual shooting mode dial or button. And, over at the other side of the power button is the largest control of all; the shutter release button which is itself encircled by a rocker switch for adjusting the zoom. This has a raised front 'lip' that is ridged for easier purchase. Personally, we prefer a back plate zoom rocker, as you can keep a thumb on this and your forefinger on the shutter release, thus cutting down composition to shot time, but placing it around the shutter button at least frees up space at the back for the video record button we've already touched on. To the right of the top plate zoom rocker we get a built-in speaker in support of the IXUS 115 HS' video clips. The microphone for this is located on the face plate, top left of the lens, whilst an AF assist/self timer lamp is set into the mirrored circles surrounding it, with the aforementioned integral flash located top right. A half press of the shutter release button meanwhile and there's a momentary pause whilst the camera determines focus and exposure, AF point/s highlighted in green with a customary bleep prompting the user to go ahead and take the shot. Whilst this is not lightning fast, it's respectably comparable with the IXUS 220 HS and budget point and shoots in its class. At full resolution, least compression setting (Large, Fine modes) a JPEG is committed to memory in around three to four seconds. Again not the swiftest ever, but we're not in competition with a DSLR here. The media of choice here is, as expected, SD, SDHC or SDXC card, with Canon having done away with any built in memory on its more recent compacts; that's also the case here, so you need to invest in a removable card first. The back of the IXUS 115 HS is expectedly dominated by that large non-touchscreen LCD in the absence of an optical viewfinder. Visibility is good despite the distinctly average 230k-dot resolution. As it takes up approximately five sixths of the available space, attendant physical controls are shunted into a space to its right, where they are vertically stacked. From the top you have the red video record button providing not only a short cut to the 'movie' feature but an almost instant response, in prompting filming to commence no matter what alternative shooting mode one might have otherwise had selected at the time. Beneath this is a familiar command pad, but once again it is small. With a function/set button at its centre, at its top and bottom, left and right we find a means of manually adjusting exposure compensation (+/- 2EV), controlling the flash (auto flash, on, off and slow synchro but no red eye reduction although there is an auto correction option selectable via the camera's shooting menu. ), plus a display option (limited to turning the screen info off to provide a clear view), and finally a means of switching between macro (as close as 3cm from a subject), default 'normal' and infinity focus settings. A press of the function button meanwhile brings up a toolbar on the left hand side of the LCD screen, with options running from top to bottom. As on the IXUS 220 HS and 310 HS, the options are a lot more limited in point and shoot Smart Auto stills capture mode as opposed to Program mode. If selecting the former via the top plate slider there are just the options to adjust the photo aspect ratio from the default 4:3 to 16:9, 3.2 or 1:1, and choose photo and video image quality. But in Program Auto mode the same toolbar adds on the chance to choose from three metering options (evaluative, centre weighted and spot), 11 'My Colors' options, ISO speeds (ISO100-3200), regular white balance and the drive mode: single shot or continuous shooting. While the above is all fairly par for the course, if highlighting and selecting the 'P' for Program icon, the shooting mode options open up further and this is where Canon throws in some rather more interesting creative choices by way of various scene modes and digital filters. Given the potential mass market audience for the IXUS 115 HS, here we get scene modes for photographing children and pets, a smart shutter mode utilising face detection to fire the shutter automatically, high speed burst mode (8.2 fps, with a resolution drop to three megapixels) and automatic best image selection (with resolution drop again), the aforementioned handheld night scene and low light modes. Canon also adds in digital effects including fisheye, miniature (for stills as well as video), along with toy camera, monochrome, super vivid, and poster options. Furthermore, as has been a feature of Canon compacts for quite some time, individual colours can be highlighted and swapped. Further scene modes cover the topics of beach photography, underwater snaps, foliage, snow, fireworks, an exposure mode for dark subjects, plus two stitch assist modes for shooting panoramas (panning left to right and vice versa). The last item on this list of shooting options is the Casio Exilim-alike Slow Motion movie mode. As on the IXUS 220 HS, this allows 240fps capture at an email friendly 320x240 pixels, or standard definition 640x480 pixels clips at 120fps. When replayed this then gives the effect of subjects wading through treacle. Moving our attention back to the camera back plate, the last two buttons on it are for the self-explanatory menu and, beside it, a dedicated playback button. The latter is useful, as because there's not a switch that physically requires being throwing to alternate between capture and review, a half press of the shutter release button when in playback mode and we were able to be back instantly to taking shots if a photo opportunity suddenly presented itself. Press the menu button meanwhile, and, as on the IXUS 220 HS, we're presented with two folders; one governing image capture and the second the set up folder. 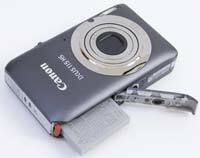 In the first folder we have the usual options, including the ability to turn the digital zoom on/off, as well as Canon's i-Contrast mode, blink detection, the ability to call up on-screen grid lines and swap the image stabilization mode between continuous, shoot only (comes into effect when the shutter release button is pressed). The second set up folder allows sound and volume to be controlled LCD brightness adjusted and the memory card in use to be formatted. There's no integral memory offered as a back up. Whilst the right hand side of the camera, if viewed from the back, features the output ports and a lug for attaching a strap, the opposite flank of the camera is devoid of features entirely. The base of the IXUS meanwhile features a screw thread for a tripod and a covered compartment housing both vacant memory card slot and rechargeable lithium ion cell, good for 230 shots (a whopping ten more than the 220 HS) from a full charge. Once again, and as we noted in our 220 HS review, whilst one could criticize the IXUS 115 HS for lacking much in the way of real photographic control, that's largely missing the point. It's user friendly, pretty much everything you want from a point and shoot camera can be found with a button press or three, it does the job, doesn't cost a king's ransom and looks reasonably stylish with it.